This Museo Mundial Project installation at the Natural History Museum in Nuremberg aims to shed light on the topic of biopiracy. It displays the connection between patented drugs we buy at the pharmacy and the medicinal plants that they are based on. The object is located close to the Costa Rica exhibition that informs visitors about shamanism and natural healing practices. 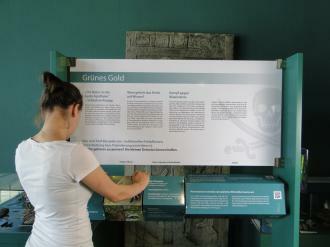 An information panel introduces the topic and explains what biopiracy means. It informs visitors about the impacts on local indigenous communities and sheds light on international discussions on preventing biopiracy. 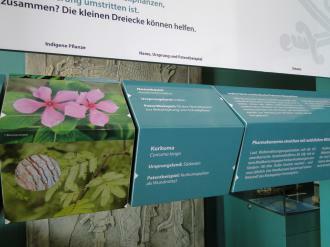 Below the information panel, five biopiracy case studies are displayed. There are four reels that you can spin with your hands. The four reels are organized as follows: (1) the disease being treated, (2) a picture of an indigenous plant, (3) the name of an indigenous plant, its origin and an example of a patent, and (4) a specific case study. The visitor can spin the reels to match the elements that refer to the same case. Dimensions of tool: 122 cm wide, 28 cm deep and 180 cm high. This tool refers to Millennium Development Goal (MDG) 6 ("Combat HIV/Aids, Malaria and other diseases") and MDG 7 ("Ensure environmental sustainability"). It demonstrates the complexity of "owning" biodiversity and addresses global health. Visit the museum you will be working with and get an overview of the exhibition. Conjointly choose the object and topic you want to work with. The appropriate form for each tool depends very much on the specific museum you choose and its individual objects. Types of objects that you might connect to this development topic include: shamanism, usage of natural herbs and health practices in other countries. Try to create a comprehensible and clear connection to the existing objects. → Try to stick as closely as possible to the thematic focus of the object you want to work with. Make connections to the region, the actors involved and the style of storytelling used in the object. Choose an aspect of the topic that is both complex enough and well defined enough. Do you want to offer an overview or would you like to concentrate on a certain part of the story? If so, which part? Develop interesting methods that can be used to implement your idea. Check how much space will be available at the museum, what technical facilities the museum can offer, which target group you want to reach and how much money you have available to invest. → Think small, start small. During the implementation process, new ideas will arise, so be sure to hold back some money to invest later! Develop a first draft of your idea, combining your ideas with those of your partners. This draft should already include a budget plan to allow you to assess the feasibility of your idea. In addition, it should include an implementation schedule. Produce a draft that everyone agrees with and send it to all partners. Ask for quotes for every stage of production. Try to get several quotes for each step so that you can choose the best offer. Try to get recommendations on subcontractors that have already worked in museums. Add up the quotes, compare the total to your budget plan and adjust it, if necessary. Choose your working partners. Create and write down the content for the information panel and for the reels. Ask your partners to proofread this first version so that you can clarify any misunderstandings at an early stage. Choose pictures and graphics that reinforce the content. Ask the copyright owners if you can use their material for educational purposes. In some cases, you might have to pay to use this material. Construct a dummy of the tool you have in mind. You can use cardboard, LEGO or something similar. This visualization helps identify issues to discuss with the carpenter. It also helps to put the size of each element of the tool into perspective. → We realized that drawing is not sufficient preparation for the conversations with the carpenter and the designer. Send a first draft to the carpenter including the desired size of the object, your text and the pictures so he/she can create a blueprint (technical drawing). Send the blueprint to the designer so he/she can start on the general layout. → Start communicating with the carpenter and the designer as soon as possible, since it will take some time to develop the overall concept. Finalize the concept, including the text, pictures and methods involved, as required by the carpenter. Ask your partners to do the final proofreading. Pay a professional proofreader if you included this in your budget plan. Send this concept to the designer. Correction loops: Several correction cycles will make the final product look more professional. Ask the designer for two or three checks. → Identify the representatives from the museum that need to give their blessing to the final product. Try to keep the circle small to save time. Make the correction process transparent to all actors involved. When the main object is completed, you can concentrate on the smaller extras. You will again need to contact the proofreader, designer and print shop, which will take some time. The final product must be transported to the museum. Find a reliable trucking company. In addition, you might find it useful to discuss with the carpenter how to protect a wood installation against damage. Experienced carpenters can also build a box for transport on request. The installation features some elements to "play" with, thereby attracting children as well as adults. It was difficult to break down this complex topic into something easier to understand without diluting key messages. The more complex an installation the more potential for errors during production. To anticipate any snags with the installation, it is important to discuss every little detail with the carpenter beforehand. Visitors stated that the installation had brought a previously unknown topic to their attention. 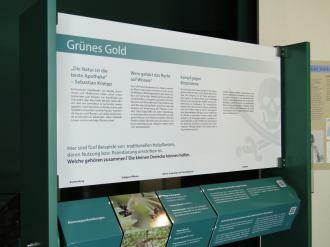 A few visitors reported that the installation displays too much text. International Journal for Information and Technology Management 2 (3), S. 184-196.